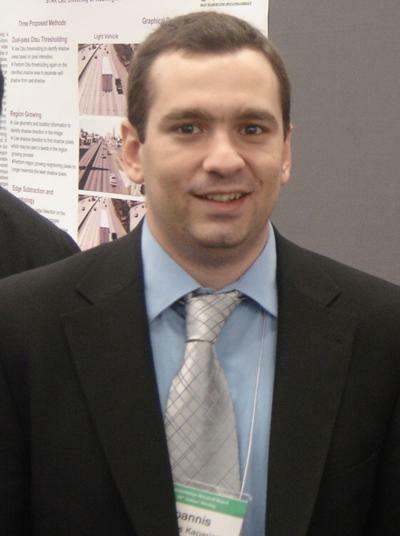 Dr Ioannis Kaparias is a Lecturer in Transport Engineering within Engineering and Physical Sciences at the University of Southampton. Dr Ioannis Kaparias graduated with a Master of Engineering (MEng) degree in Civil Engineering from Imperial College London in 2004, having spent his final year of study at RWTH Aachen University in Germany. He then joined the Centre for Transport Studies of Imperial for his PhD research on the topic of Reliable Dynamic In-vehicle Navigation, in collaboration with BMW Group, which he completed in 2008, and continued as a post-doctoral Research Associate in the same institution for a period of four years, working on a wide range of transport research projects. From 2012 he held a Lecturer position at City, University of London, and in 2016 he joined the Transportation Research Group (TRG) of the University of Southampton as a Lecturer in Transport Engineering. He is an Associate Fellow of the Higher Education Academy (AFHEA), and a chartered engineer in Greece as a member of the Technical Chamber of Greece (TEE) and of the Society of Greek Transport Engineers (SES). He is a member of the User Information Systems committee of the Transportation Research Board (AND20) and of the Executive Committee of the Universities’ Transport Study Group (UTSG), where he currently holds the role of the Honorary Treasurer. He is also Honorary Lecturer at the Centre for Transport Studies of Imperial College London, as well as an independent expert for the European Commission in research and innovation activities. Aside from English and his native Greek, he also speaks German, French and Italian. Ioannis has a diverse research profile spanning across a wide range of areas in the field transport engineering. His research interests include traffic engineering, modelling and simulation, Intelligent Transport Systems (ITS), network reliability, travel demand, Operations Research, travel behaviour, and transport and public realm, and his work has led to several journal publications and presentations at international conferences. His track record includes the participation to research projects funded by the European Commission (FP7 CONDUITS and FP7 NEARCTIS), the Royal Borough of Kensington and Chelsea (Traffic monitoring of the Exhibition Road scheme), Transport for London (BENEFIT), BMW Group (OFFENSIVE - Open systems in traffic), PTV AG (Field testing of portable navigation systems) and Kapsch TrafficCom (CONDUITS-DST). “CONDUITS-DST: Further development of the CONDUITS Key Performance Indicators” (sponsored by Kapsch TrafficCom through POLIS aisbl) - Principal Investigator. Implementation of the CONDUITS performance evaluation framework for urban traffic management and ITS in a novel decision support tool, using the output of microscopic and macroscopic traffic simulation tools. “Modelling and incorporating travel time reliability in public transport” (sponsored by City University’s Research Pump-Priming Fund) - Principal Investigator. Further development of an existing travel time quantification approach from car traffic to public transport and applying it to part of London’s bus network. “Real-time tracking and modelling of interactions between heavy vehicles and vulnerable road users at blind turns” (sponsored by City University Doctoral Studentships) - PhD supervisor (S. Miah). Development of a novel system architecture and instrumented bicycle for the avoidance of often fatal crashes between cyclists and heavy vehicles in large cities. “Novel strategies and algorithms for energy-efficient urban traffic management” (sponsored by City University Doctoral Studentships) - PhD supervisor (M. Mamouei). Development of new methodologies for urban traffic management, which aim at optimising the overall energy consumption at the network-level. “Integrated multimodal trip planning for air and ground transport” – PhD supervisor (S. Hossain). Development of a new reliability-based passenger door-to-door route planning algorithm for long-distance trips involving both land and air transport. “Monitoring the Exhibition Road single surface scheme” (sponsored by the Royal Borough of Kensington and Chelsea) - Main researcher at Imperial College London. Conduct of a series of research studies related to the Exhibition Road redevelopment scheme covering a wide range of transport aspects, such as traffic conflicts, perceptions of pedestrians and drivers, and travel behaviour, but also research extending beyond the scope of Exhibition Road itself, such as the investigation of the willingness to share space of pedestrians and drivers, the impacts on road safety, and the financial impacts of similar schemes. “CONDUITS: Coordination of Network Descriptors for Urban Intelligent Transport Systems” (sponsored by the European Commission through the 7th Framework Programme (FP7)) - Main researcher at Imperial College London. Collaborative international project with the objective of developing a framework enabling the evaluation of urban traffic management policies and technologies. The main outcome was the definition and testing of a set of Key Performance Indicators in the areas of traffic efficiency; traffic safety; pollution reduction; and social inclusion and land use. “NEARCTIS: Network of Excellence for Advanced Road Cooperative Traffic Management in the Information Society” (sponsored by the European Commission through FP7) - Main researcher at Imperial College London. Collaborative international project with the objective of the identification and development of Intelligent Transport Systems (ITS) solutions to the main transport problems (safety; energy consumption; environmental impacts; and congestion) within the framework of a virtual research centre through the integration of the research activities of a number of participating institutions. “BENEFIT: Benchmarking of Efficient Infrastructure and Transport” (sponsored by Transport for London) - Main researcher at Imperial College London. Conduct of a comparative analysis study and coordination of the first steps towards the formation of a worldwide city benchmarking club for road traffic management and infrastructure. “Reliable Dynamic In-vehicle Navigation” (sponsored by BMW Group within the framework of the “OFFENSIVE” collaborative research project) - Main PhD researcher at Imperial College London. Development of a new algorithm that evaluates travel time reliability based on historical data, and considers it in the search for optimal routes in the road network. With the prospect of making use of the algorithm in in-vehicle navigation systems, the research extended to the development of software (ARIAdNE), as well as to its application through laboratory and field experiments, which demonstrated its superiority compared with existing conventional navigation systems. “Personalised Route Guidance” (sponsored by BMW Group within the framework of the “OFFENSIVE” collaborative research project) - Supporting researcher at Imperial College London. Use of machine learning techniques in route guidance, so as to be able to derive the driver’s preferences and to consider them in route finding. The project resulted in the development of an algorithm for this purpose. Kaparias, I., Manassa, E., Eden, N., Tsakarestos, A., Schmitz, P., Hoadley, S., & Hauptmann, S. (2016). Policy-aware assessment of environmental impacts from transport in smart cities. Journal of Smart Cities, 2(2), 60-68. Bell, M. G. H., Kaparias, I., Nocera, S., & Zavitsas, K. (2012). Presence of urban ITS architectures in Europe: results of a recent survey. Ingegneria Ferroviaria, 5, 447. Kaparias, I., Bell, M. G. H., Belzner, H., Leonhardt, A., & Bogenberger, K. (2009). Zuverlässige dynamische zielführung – Reliable dynamic route guidance. Strassenverkehrstechnik, 9, 574-581. Chen, Y., Kaparias, I., Bell, M. G. H., & Bogenberger, K. (2005). Reliable autonomous route guidance by a constrained A* search considering intersection delays. In H. Van Zuylen (Ed. ), The Reliability of Traveling and the Robustness of Transport Systems (pp. 69-92). Netherlands: TRAIL Research School. Miah, S., Milonidis, E., Kaparias, I., & Karcanias, N. (2018). A novel fusion algorithm to improve localisation accuracy of an instrumented bicycle. Paper presented at 97th Annual Meeting of the Transportation Research Board, Washington, United States. Kaparias, I., Gao, Y., & Miah, S. (2018). A study on the effects of highway and traffic characteristics on cyclist behaviour using an instrumented bicycle. Paper presented at 7th Symposium of the European Association for Research in Transportation, Athens, Greece. Veerapanane, S., Taylor, A., & Kaparias, I. (2018). A utility-based model for the evaluation of “Mobility as a Service” applications. Paper presented at 97th Annual Meeting of the Transportation Research Board, Washington, United States. Yoon, S., Preston, J., & Kaparias, I. (2018). Comparative traffic data analysis for a motorway with a tunnel segment. Paper presented at 50th Annual Conference of the Universities’ Transport Study Group, London, United Kingdom. Christoforou, Z., Chandakas, E., & Kaparias, I. (2018). Short-term prediction of on-board passenger volumes in public transport vehicles based on non-exhaustive Automatic Passenger Counting data. Paper presented at 7th Symposium of the European Association for Research in Transportation, Athens, Greece. Mamouei, M. H., Kaparias, I., & Galatioto, F. (2018). Validation of a system-level fuel economy based control method for autonomous vehicles. Paper presented at 50th Annual Conference of the Universities’ Transport Study Group, London, United Kingdom. Christoforou, Z., Chandakas, E., & Kaparias, I. (2017). An investigation of dwell time patterns in urban public transport systems: The case of the Nantes tramway. Paper presented at 8th International Congress on Transport Research in Greece, Thessaloniki, Greece. Nilles, M., & Kaparias, I. (2017). Assessing network-level walkability in relation to highway design standards: the case study of Luxembourg. Paper presented at 8th International Congress on Transport Research in Greece, Thessaloniki, Greece. Miah, S., Milonidis, E., Kaparias, I., Stirling, D., & Karcanias, N. (2017). Cyclist 360° Alert: Validation of an instrumented bicycle trajectory reconstruction mechanism using satellite and inertial navigation systems. Paper presented at 49th Annual Conference of the Universities’ Transport Study Group, Dublin, Ireland. Mamouei, M. H., Kaparias, I., & Halikias, G. (2017). Development of fuel-efficient driving strategies for Adaptive Cruise Control. Paper presented at 49th Annual Conference of the Universities’ Transport Study Group, Dublin, Ireland. Kaparias, I., Rossetti, C., & Holloway, C. (2017). Investigating the value of waiting time at bus stops. Paper presented at 96th Annual Meeting of the Transportation Research Board, United States. Hadjidimitriou, S., Kaparias, I., & Dell'Amico, M. (2017). Investigating urban bus travel time reliability patterns in London using iBus Automatic Vehicle Locating and Live Bus Arrivals data. Paper presented at 6th Symposium of the European Association for Research in Transportation, Haifa, Israel. Hossain, S., Kaparias, I., & Karcanias, N. (2017). Reliability-based route guidance in air transport networks. Paper presented at 49th Annual Conference of the Universities’ Transport Study Group, Dublin, Ireland. Cohen, Y., Makri, S., Reymann, S., & Kaparias, I. (2017). User-centred design in public transport: Discovering mobile user needs. Paper presented at 12th European Intelligent Transport Systems Congress, Strasbourg, France. Christoforou, Z., Chandakas, E., & Kaparias, I. (2016). An analysis of dwell time and reliability in urban light rail systems. Paper presented at 95th Annual Meeting of the Transportation Research Board, United States. Miah, S., Kaparias, I., Stirling, D., & Liatsis, P. (2016). Development and testing of a prototype instrumented bicycle for the prevention of cyclist accidents. Paper presented at 95th Annual Meeting of the Transportation Research Board, United States. Miah, S., Kaparias, I., & Liatsis, P. (2016). Evaluation of MEMS sensors accuracy based on an instrumented bicycle for the purpose of tracking and positioning. Paper presented at 48th Annual Conference of the Universities’ Transport Study Group, United Kingdom. Kaparias, I., Hirani, J., Bell, M. G. H., & Mount, B. (2016). Pedestrian gap acceptance behaviour in street designs with elements of shared space. Paper presented at 95th Annual Meeting of the Transportation Research Board, United States. Kaparias, I., Manassa, E., Eden, N., Tsakarestos, A., Schmitz, P., Hoadlley, S., & Hauptmann, S. (2016). Policy-aware environmental impact assessment for urban mobility and Intelligent Transport Systems. Paper presented at 95th Annual Meeting of the Transportation Research Board, United States. Mamouei, M. H., Kaparias, I., & Halikias, G. (2016). Using unscented particle filtering as a tool for the comparison of car-following models. Paper presented at 95th Annual Meeting of the Transportation Research Board, United States. Mamouei, M. H., Kaparias, I., & Halikias, G. (2015). A quantitative approach to behavioural analysis of drivers in highways using particle filtering. Paper presented at 47th Annual Conference of the Universities Transport Study Group, United Kingdom. Kaparias, I., Rossetti, C., & Trozzi, V. (2015). Analysing passenger arrivals rates and waiting time at bus stops. Paper presented at 94th Annual Meeting of the Transportation Research Board, United States. Miah, S., Kaparias, I., & Liatsis, P. (2015). Cyclist 360° Alert: development and testing of a prototype instrumented bicycle model for the prevention of cyclist accidents. Paper presented at 47th Annual Conference of the Universities’ Transport Study Group, United Kingdom. Kaparias, I., Liu, P., Tsakarestos, A., Eden, N., Schmitz, P., Hoadley, S., & Hauptmann, S. (2015). Development and testing of a predictive traffic safety evaluation tool for road traffic management and ITS impact assessment. Paper presented at International Scientific Conference on Mobility and Transport (Mobil.TUM 2015), Germany. Dell'Amico, M., Hadjidimitriou, S., & Kaparias, I. (2014). A descriptive study on public transport user behaviour from Live Bus Arrivals. Paper presented at 2nd Conference on Sustainable Urban Mobility, Greece. Kaparias, I., Bell, M. G. H., Biagioli, T., Bellezza, L., & Mount, B. (2014). Behavioural analysis of vehicle-pedestrian interactions: the case of street designs with elements of shared space. Paper presented at 93rd Annual Meeting of the Transportation Research Board, United States. Mamouei, M. H., Kaparias, I., & Halikias, G. (2014). Development of fuel-efficient driving strategies for Adaptive Cruise Control. Paper presented at 3rd Symposium of the European Association for Research in Transportation, Leeds, United Kingdom. Kaparias, I., Bell, M. G. H., Singh, A., Dong, W., Sastrawinata, A., Wang, X., & Mount, B. (2013). Analysing the perceptions and behaviour of cyclists in street environments with elements of shared space. Paper presented at 45th Annual Conference of the Universities’ Transport Study Group, Oxford, United Kingdom. Kaparias, I., Bell, M. G. H., Dong, W., Sastrawinata, A., Singh, A., Wang, X., & Mount, B. (2013). Analysis of pedestrian-vehicle traffic conflicts in street designs with elements of shared space. Paper presented at 92nd Annual Meeting of the Transportation Research Board, Washington, United States. Trozzi, V., Gentile, G., Bell, M. G. H., & Kaparias, I. (2013). Dynamic user equilibrium in public transport networks with passenger congestion and hyperpaths. Paper presented at 20th International Symposium on Transportation and Traffic Theory (ISTTT20), Netherlands. Trozzi, V., Gentile, G., Kaparias, I., & Bell, M. G. H. (2013). Route choice model and algorithm for dynamic assignment in overcrowded bus network with real-time information at bus stops. Paper presented at 92nd Annual Meeting of the Transportation Research Board, Washington, United States. Eden, N., Kaparias, I., Tsakarestos, A., Gal-Tzur, A., Schmitz, P., Hoadley, S., ... Hauptmann, S. (2013). Using Key Performance Indicators for multi-criteria traffic management strategic decisions. Paper presented at 9th European Intelligent Transport Systems Congress, Ireland. Kaparias, I., Bell, M. G. H., Gosnall, E., Abdul-Hamid, D., Dowling, M., Hemnani, I., & Mount, B. (2012). Assessing the pedestrian experience in public spaces. Paper presented at 91st Annual Meeting of the Transportation Research Board, United States. Trozzi, V., Gentile, G., Kaparias, I., & Bell, M. G. H. (2012). Dynamic hyperpath search in public transport networks with boarding queues at stops. Paper presented at 44th Annual Conference of the Universities’ Transport Study Group, United Kingdom. Trozzi, V., Gentile, G., Kaparias, I., & Bell, M. G. H. (2012). Dynamic user equilibrium hyperpaths in bus networks with passenger queues at stops. Paper presented at 1st European Symposium on Quantitative Methods in Transportation Systems, Lausanne, Switzerland. Trozzi, V., Bell, M. G. H., Gentile, G., & Kaparias, I. (2012). Route choice model for public transport networks with passenger queues and online travel information at stops. Paper presented at 4th International Symposium on Dynamic Traffic Assignment (DTA2012 Symposium), United States. Eden, N., Tsakarestos, A., Kaparias, I., Gal-Tzur, A., Schmitz, P., Hauptmann, S., & Hoadley, S. (2012). Using Key Performance Indicators for traffic management and Intelligent Transport Systems as a prediction tool. Paper presented at 19th World Congress on Intelligent Transport Systems, Austria. Kaparias, I., Bell, M. G. H., Biagioli, T., Chan, C., Kennedy, J., & Mount, B. (2011). A behavioural analysis technique for vehicle-pedestrian interactions. Paper presented at 43rd Annual Conference of the Universities’ Transport Study Group, United Kingdom. Mercieca, J., Kaparias, I., Bell, M. G. H., & Finch, E. (2011). Integrated street design in high-volume junctions: the case study of London's Oxford Circus. Paper presented at 1st International Conference on Access Management, Greece. Kaparias, I., Bell, M. G. H., Chan, C., Biagioli, T., Kennedy, J., & Mount, B. (2011). Investigating the willingness of drivers to share space with pedestrians. Paper presented at 90th Annual Meeting of the Transportation Research Board, United States. Tsakarestos, A., Nocera, S., Kaparias, I., & Eden, N. (2011). Performance evaluation of urban traffic management and ITS: The Rome case study. Paper presented at SIDT National Conference and Scientific Seminar 2011, Italy. Zavitsas, K., Kaparias, I., Bell, M. G. H., & Nocera, S. (2011). Urban traffic management and Intelligent Transport Systems: a European perspective. Paper presented at 90th Annual Meeting of the Transportation Research Board, United States. Kaparias, I., Bell, M. G. H., Greensted, J., Cheng, S., Miri, A., Taylor, C., & Mount, B. (2010). Development and implementation of a vehicle-pedestrian conflicts analysis method: Adaptation of a vehicle-vehicle technique. Paper presented at 89th Annual Meeting of the Transportation Research Board, United States. Kaparias, I., Bell, M. G. H., Miri, A., Cheng, S., Greensted, J., Taylor, C., & Mount, B. (2010). Modelling the willingness of pedestrians to share space with vehicles. Paper presented at 42nd Annual Conference of the Universities’ Transport Study Group, United Kingdom. Kaparias, I., Bell, M. G. H., & Belzner, H. (2008). Field testing of a reliable in-vehicle navigation algorithm. Paper presented at 10th International Conference on Applications of Advanced Technologies in Transportation, Greece. Kaparias, I., Bell, M. G. H., & Belzner, H. (2008). Quantifying and measuring travel time reliability for in-vehicle navigation systems. Paper presented at 87th Annual Meeting of the Transportation Research Board, United States. Kaparias, I. (2007). A time-dependent risk-averse algorithm for reliable in-vehicle navigation. Paper presented at 39th Annual Conference of the Universities’ Transport Study Group, Harrogate, United Kingdom. Park, K., Bell, M. G. H., Kaparias, I., & Bogenberger, K. (2007). An adaptive route choice model by a rule-based approach for intelligent route guidance. Paper presented at 86th Annual Meeting of the Transportation Research Board, United States. Kaparias, I., Bell, M. G. H., Bogenberger, K., & Chen, Y. (2007). An approach to time-dependence and reliability in dynamic route guidance. Paper presented at 86th Annual Meeting of the Transportation Research Board, United States. Park, K., Bell, M. G. H., Kaparias, I., & Belzner, H. (2007). Development of a software tool to learn user preferences for personalised route guidance. Paper presented at 14th World Congress on Intelligent Transportation Systems, China. Hu, J., Kaparias, I., & Bell, M. G. H. (2007). Identification of link congestion dependence patterns for dynamic route guidance. Paper presented at 14th World Congress on Intelligent Transportation Systems, China. Park, K., Bell, M. G. H., Kaparias, I., & Bogenberger, K. (2007). User modelling approach to adaptive route selection in intelligent vehicle navigation. Paper presented at 11th World Conference on Transport Research, United States. Kaparias, I., Bell, M. G. H., Chen, Y., & Bogenberger, K. (2006). ICNavS: A tool for reliable route guidance. Paper presented at 13th World Congress on Intelligent Transportation Systems, United Kingdom. Park, K., Bell, M. G. H., Kaparias, I., & Bogenberger, K. (2006). Learning user preferences of route choice behaviour for adaptive route guidance. Paper presented at World Congress on Intelligent Transportation Systems, United Kingdom. Kaparias, I. (2006). Risk-averse dynamic route guidance: Observations from the application on a real network. Paper presented at 38th Annual Conference of the Universities’ Transport Study Group, Ireland.